Yet again we’ve been busy this week. This video is a recent capture of our game. But wait, there is more! This blogpost may be a bit delayed, as compensation this post is filled with some wonderful GIFs. 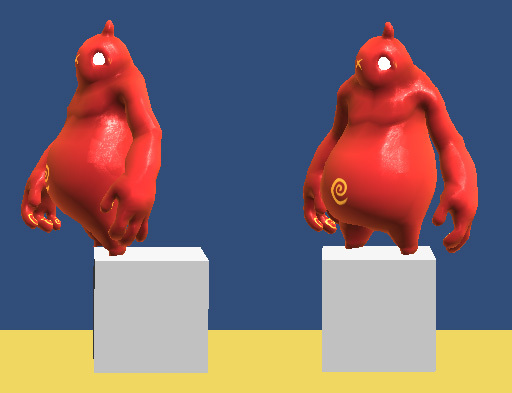 We’ve been discussing working on two different features for Mercury Shift 3D. The decision between implementing network-based multiplayer or a level-editor has been on our mind for quite some time now. I’ll be writing something more in-depth about this, but in general we made the decision in favor of the multiplayer. It supports our core mechanic the most. With more players and maybe something of a community on the horizon we’ll be thinking about an level-editor again later. He has also improved the “special” look of the special coin with some particle effects. Meanwhile, Simon has been working on improving shaders and adding new ones. There now are some very nice glowy effects for fireflies. And there is some moving grass that is being affected by players passing them. It really adds to the feel of the game, especially in the forest part. But the technique can be applied to more than just that one stage. Another important thing for the atmosphere is light and shadow. We have been lightbaking and testing the lightbaking process to accomplish our target rendering, but we’re still not too happy. 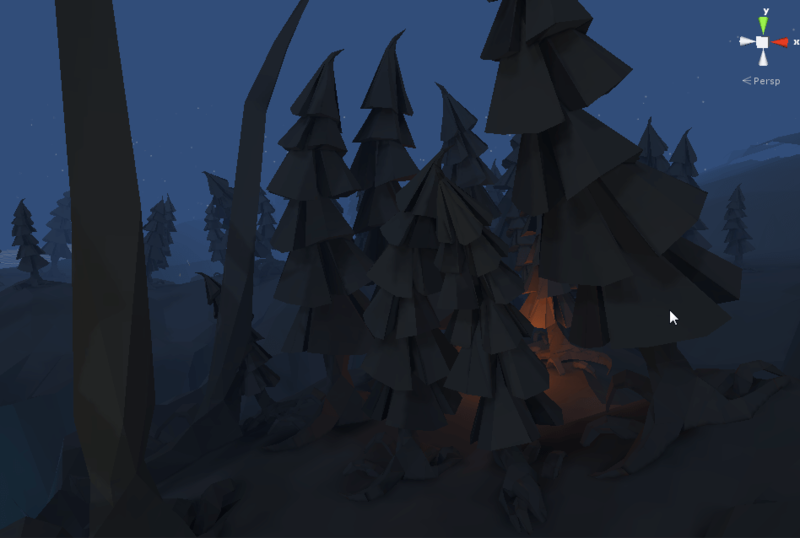 But here is a scene from a lightbake without shaders applied. Animations are progressing really fast. I had the chance to take a look at the complex triggering and blending system. It’s pretty complex and depends on a sensor system, that detects a big amount of events to trigger according animations. For example, the staggering on an edge will only be triggered when the distance to the ground is more than 3 meters. If not, there is a match-IK system, that aligns the feet to the ledge, not using additional animations. Also, the foot IK has been reworked by Rika. 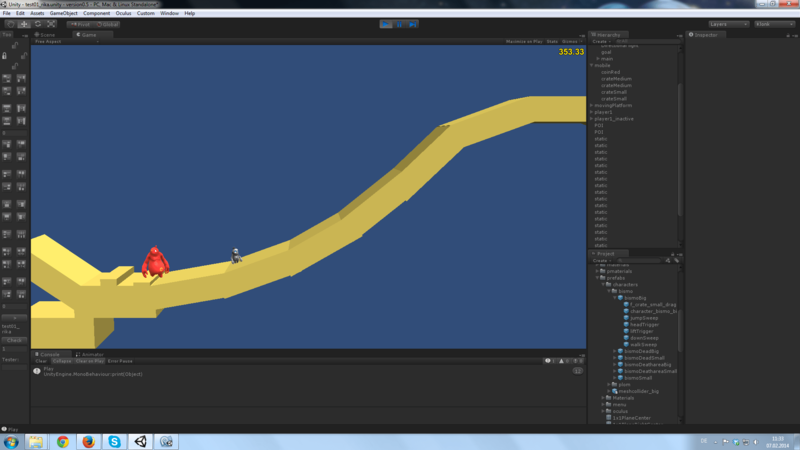 The characters are now able to adjust to slopes and different heights. Yet again, this is not a core feature but it really adds to the readability and believeability of the characters. With the singleplayer we have been having issues of players not distinguishing between the swap and the shift. So there is A) the animation feedback as in a small “wake up animation” and B) an additional arrow, that gets displayed on the activated player after a switch. Although it may not be a final solution and it looks a bit off from the game, it really helps when playing the singleplayer. The inactive animations should look a bit sluggish and passive in opposite to the waking up of the characters. The wake up is an animation, that symbolizes energy going into the character and the little jump should draw the attention to the activated character. B) the additional graphics for the swap. 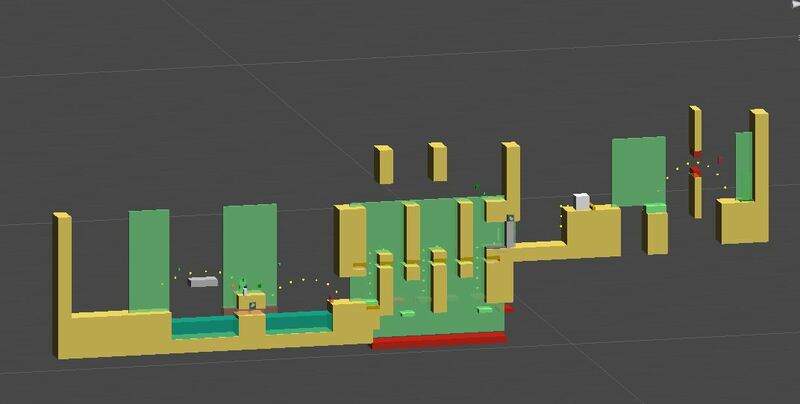 And there is more level-design happening. This is what one of the levels looks like when no graphics have been added. Maybe you can already see that this level is specially designed for the canyon. The artists have been working closely with gamedesigners, to have the level topography corresponding witht he look of the levels. Alright, that’s it for the week. We have had some external work and the Autodesk BarCamp in Munich, which was pretty cool. Looking forward to their LT products. And this are the past posts from week 1 and week 2. This entry was posted in Dev Diary, Devblog and tagged Dev Diary, Gamedev, Indie Game, indiegames, Mercury Shift 3D. Bookmark the permalink.